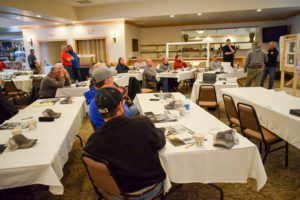 An open house that put about two dozen United Building Supply contractors together with several vendors, as well as a 3.5-credit continuing education class, turned into a big win for everyone. The open house, held at Breaking Bread in Sheboygan, was the first time in several years that UBS has provided an opportunity for contractors to get the educational credits they need. 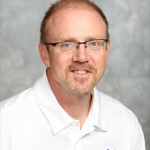 The educational component was led by Tom Harris of OSI sealant. 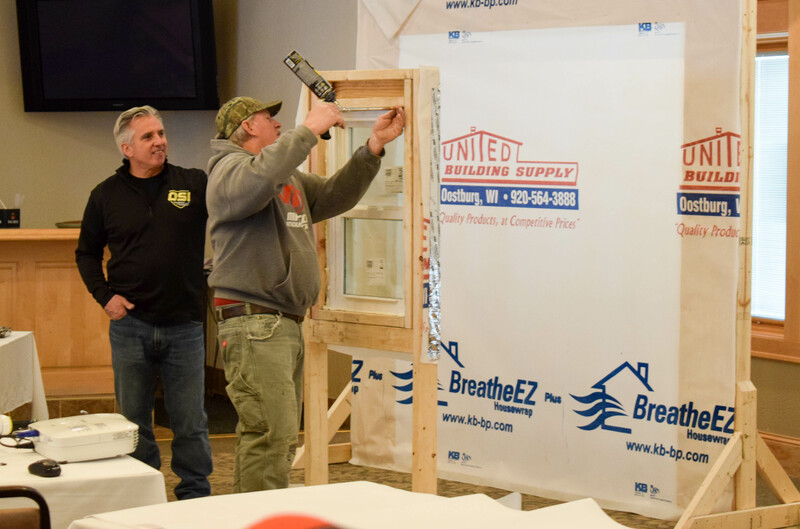 As part of the course, volunteers from the class took a turn using OSI caulk on a window and also worked together to install a sliding patio door in a temporary frame. Outdoor living season is coming, and along with your deck or patio, potted geraniums and outdoor furniture, there is one thing that really makes or breaks your home’s exterior look — the railings around the porch, deck, patio or pool. 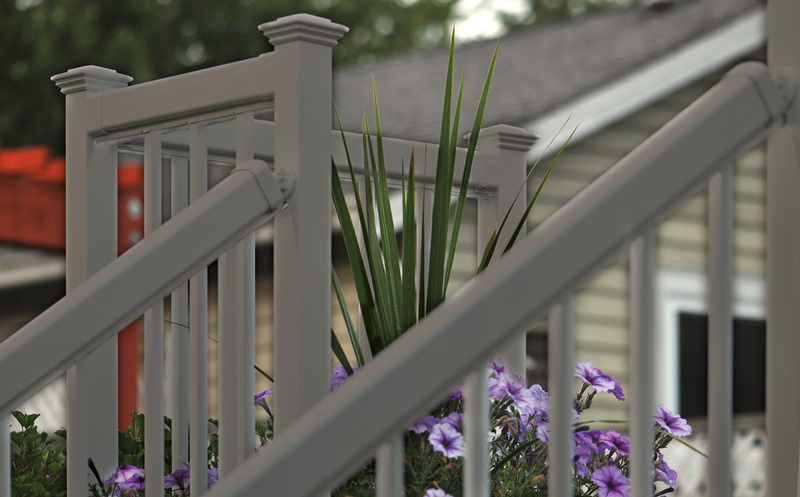 No matter what look you want, Regal Ideas, one of the largest and most well-known aluminum railing brands in North America, has exactly what you’re looking for. What is one thing all builders know that many homeowners don’t? 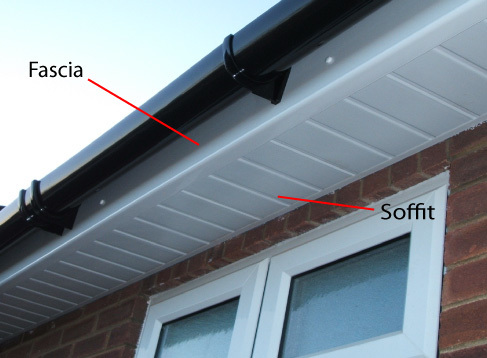 The purpose and function of soffit and fascia. Soffit is the underside of the roof, sort of like the skin that covers your eaves — without it, rafter beams would be visible. Covering them with soffit gives the house a unified, tidy look and protects the rafters from the elements. Fascia, the band that runs horizontally under the roof’s edge, typically goes hand-in-hand with soffit, and United Building Supply offers fascia in two sizes and a wide variety of colors. We offer LP Smartside Soffit products, which are an efficient and economical alternative to MDO and plywood soffits. 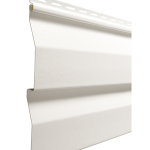 Soffit options are available in three of LP’s product collections, each with a range of styles and profiles. In addition, we have 35 colors of trim coil in stock to make sure builders have exactly what they need when they need to match aluminum trim with siding or windows. Our aluminum trim is made by Alsco Building Products, one of the industry’s leading manufacturers. Slow season has arrived, and it’s a great time to take a new look at United Building Supply. Over the past year, we have added many new items to the inventory we keep in stock and we’re more ready than ever to help builders and contractors achieve success in 2017. Whatever you need for the projects you take on — siding, windows, doors, soffit and fascia, insulation and plenty more — we make it our business to get you what you need, on time and with the kind of customer service you could never get at a big-box store. The relationships we have with the many builders and contractors we do business with are our highest priority. Keep an eye on our website for updated information on products we keep in stock, and let us know how we can help you have the best year ever in 2017. For close to 30 years, we’ve been working with regional builders and building a reputation for superior customer service, and we’re eager to show people what it’s like to work with UBS on a project. In the meantime, everyone here at United Building Supply wishes you a very Merry Christmas, a happy New Year and a peaceful and prosperous 2017. Thank you for your continued business. Tom Mullens took a long and winding road to where he is today. Like many in his business, he started learning his trade at the elbow of his father. Mullens’ dad owned a roofing and siding business in Florida, and they two worked together for many years. In 1987, Mullens opened his own business, but eventually put that business into hiatus and worked for another contractor for a few years. in 2004, he started back up with Mullens Siding & Roofing and has never looked back. With four full-time employees and a stable of sub-contractors, Mullens is busy. Most of his business is word of mouth — “I don’t touch the computer” — but it works perfectly for him. Despite the name of the business, Mullens can do just about anything: flooring, remodels, basements, etc. “You name it, we do it,” he said. He started working with United Building Supply both times he was in business for shingles and siding. Mullens’ son, Thomas, is one of the four full-timers on his roster and he’ll be taking over the business when the patriarch decides to retire. That’s coming, but not yet. And in the meantime, as Thomas shifts to running more and more of the operation, the calls keep coming for new siding, now roofing and more. “We’re usually scheduled about two months behind,” he said. It’s not just Christmas shopping season, it’s also a great time to stock up on a lot of reduced-price materials in stock at United Building Supply! 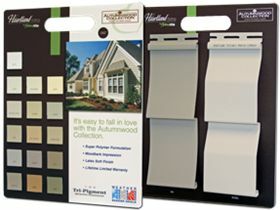 Heartland Ultra .40 vinyl siding, in almond, cream, clay, pewter, sandalwood, sienna and white, is priced at $56/square. A great choice for sheds, garages, cabins up north and other outbuildings or structures. 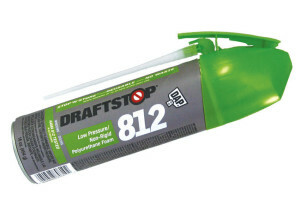 Draftstop 812 foam for sealing cracks and gaps around the outside of windows. A great deal at $14.40 for contractors who already have the applicator gun. 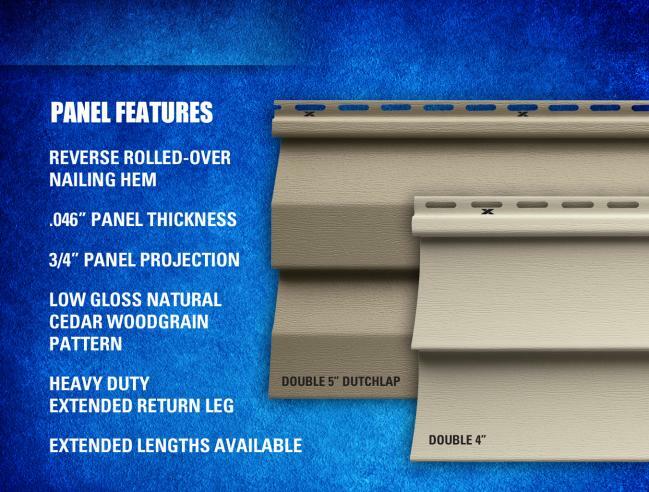 Waterproof, Draftstop 812 is what Nyhof Custom Gutter uses on all its window installation projects. 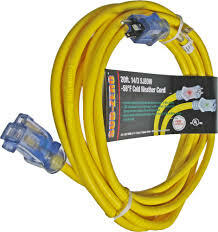 Rubber coated extension cords from Subzero. They stay flexible in the cold and there is a lifetime warranty on the ends. 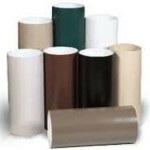 Prices are $50.56 for 50 feet (compared to $72 at big box stores) or $97.47 for 100 feet (compared to $150). 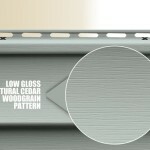 Woodsman Select 0.42 vinyl siding from Norandex, on sale for 5 percent off. We’ve got a huge list of colors, including two new ones, maverick brown and graphite, in stock. Quality Edge soffit and fascia, and coil, all in stock. 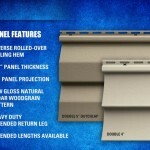 The soffit is quad 4; fascia is ribbed, 6-inch and 8-inch; and trim coil is 24-inch by 50 roll in more than 30 colors. Homebuilding is in Mike Werner’s blood. 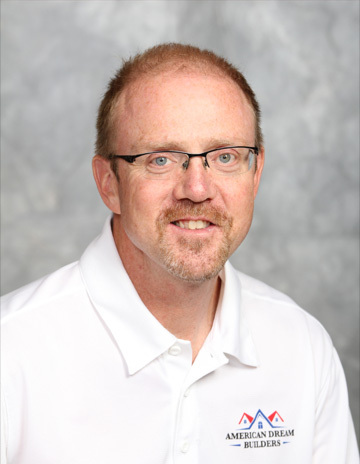 With 21 years in the homebuilding industry, including 15 with his family business and several more remodeling and flipping homes, Mike struck out on his own in 2013 and founded American Dream Builders. Mike is United Building Supply’s Builder of the Month for September. Though his last name is synonymous with home building in Sheboygan County, Mike is doing things a little differently than big companies like Werner Homes do them. The low overhead translates to more flexibility for Mike’s customers. What does that mean? It means that no matter what kind of home a client wants – large or small, intricate custom details or standard fixtures – Mike can make it happen. After getting a business degree, Mike joined Werner Homes in sales department and worked alongside his brother, Bob, for 15 years. When the housing market stalled in 2010, Mike put his knowhow to work buying and flipping houses in Sheboygan County. It was a successful venture for him, but had his eye on something else. The first five houses built by American Dream Builders were spec houses, and three of them sold before they were even completed. Though Mike is not a carpenter, he knows what people wants and he knows how to design a home that will suit a family’s needs. He hires local subcontractors and works with them to construct exactly the home his clients want. Mike started working with United Building Supply back when he was at Werner Homes and never saw a reason to change. He gets all the siding for his projects from UBS and is looking at adding Marvin Integrity windows. 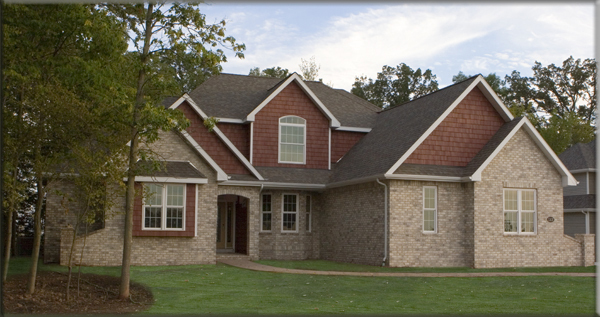 In addition, he turns to Nyhof Custom Gutter & Aluminum for custom gutters on his homes. UBS also gives Mike the customer service he wants, from working with Jack Ebbers on ordering to the delivery of supplies and pickup of leftover materials. 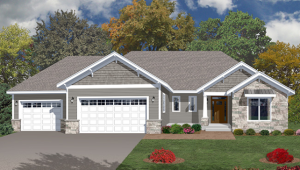 American Dream Builders is wrapping up participation in its third Sheboygan County Home Builders Association Parade of Homes this weekend, and Mike said that event has been a great way to spread the word about his young business. After working with his dad in home construction for 20 years, Dave Zelm decided to strike out on his own. That was 20 years ago, and his business, Prestige Builders, has become one of the most reputable contractors in the Sheboygan area. For their commitment to quality and outstanding work, Prestige Builders is our Builder of the Month for August. Of course, custom homes are not the only thing Prestige does. 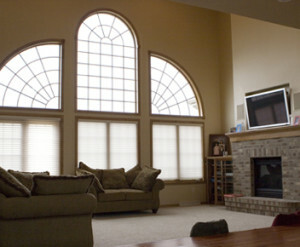 They’re also a go-to company for remodels or additions. Dave said what sets him apart from other builders, aside from the fact that he keeps a lean staff and still does a lot of the work himself, is design services. One of Dave’s enterprises is Prestige Estates on Oriole Lane in Howards Grove, a 28-acre subdivision that still has 10 lots available. One of the things he does for prospective clients is give them a long list of former clients for them to call for a reference. His portfolio also includes some large homes in Kohler, condos as well as a Florida home for someone in the Kohler family. Dave has been doing business with United Building Supply since he opened his doors. Over the years, he has added to the number of items he buys from UBS for his clients: Lindsay windows, siding, insulation, gutters, shingles, soffit and fascia. A good relationship with United Building Supply has been good for Dave as he builds spec homes in Prestige Estates and handles client projects. Builders! We have some exciting news for you as your plan/start/finish your late-summer projects. We have a selection of popular supplies marked down right now. Take a look! 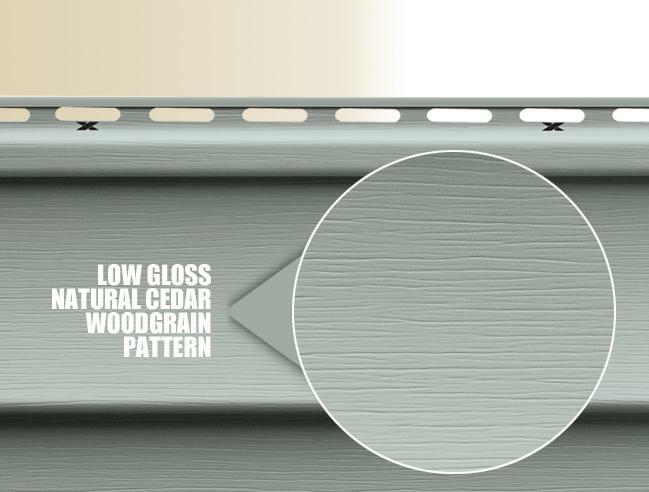 The Heartland Ultra .040 vinyl siding we have in stock is going for a sale price $56 per square (regular price, $62/square). Norandex Great Barrier .046 siding is on sale now for 5 percent off. Norandex Woodsman Select .042 in sand, dune or almond is going fast for $50/square, (regular price $72). And finally, 24-inch by 50-foot Quality Edge trim coil in snow mist (also known as white) is on sale for $74/roll. For all the supplies you need to serve your customers on time and on budget, count on United Building Supply. When Nick Kartes started J&N Construction, he was taking control of his own life. It was 2008, and he was a union apprentice in carpentry who was repeatedly laid off. “I was sick of getting laid off so I started my own company,” Nick said. Since the day he opened his doors, Nick has been a loyal and enthusiastic customer of United Building Supply. For that reason, and for all the good work he’s has done all over southeast Wisconsin, J&N Construction is our Builder of the Month for July. Specializing in new home construction, new garage construction and siding, the list of things J&N can and will do for clients is long. Everything from roofing, carpentry and tile work to remodels of bathrooms, basements and kitchen is on their can-do list. And even, on occasion, snow removal. J&N Construction employs 11 people, who make up two framing crews, a siding crew and a trim crew, in addition to a couple other people who go to whichever team needs them. That’s a big staff for his business and it reflects the way the construction industry is bouncing back, Nick said. Not that he’d know anything about that. J&N Construction was voted Best Contractor in Sheboygan County in both 2013 and 2015 in The Sheboygan Press Best Of poll. For the entire life of his business, Nick has done business with United Building Supply. “Anything I can get from them I buy through them,” he said. That includes everything from siding and soffit and fascia down to nails. A working relationship with Jack Ebbers on our staff has made all the difference. “I’ve known him for eight years – he makes sure I have what I need when I need it,” Nick said.